Ok, so this is actually two ideas combined. Obviously there has been a lot of discussion about where the story of buried is going to continue, especially considering the two potential endings. Which one will they continue? Well I say why not both? So I have an Idea for a gameplay mechanic based on something in The Legend of Zelda: Skyward Sword. Anyway this would be a lot easier to describe if I had a map concept in mind. Let's just say there is a map that takes place in like, an abandoned factory in a desert. None of the machines work, everything is destroyed, and sand is everywhere. This is a result of the Maxis ending, where the world is screwed. Just keep that general map idea in mind as an example. However, that's only part of it. There are also special items that can be activated around the map. They are basically smaller, portable versions of the temporal displacement machine I described above. They are just glowing spheres, and when activated, a roughly 15 foot radius sphere like a bubble appears, and everything in that sphere becomes like it is in the alternate timeline. Back to the example. Let's say you're in the Maxis timeline, and the pack a punch machine is half buried in sand and unusable. Place a temporal displacement sphere near it, and everything in the radius comes to life like in the Richtofen timeline. The pack a punch machine gets reverted to its normal clean state, and now you can use it. In this way you can basically cherrypick which things you want to cross over. Here's another example. Let's say there's a ledge you can't reach from the Richtofen timeline. Switch the whole map over to Maxis and now you can climb a sand dune to reach it. From the ledge there is yet another ledge inaccessible due to broken machinery blocking your path. You can't just switch the whole map over to the Richtofen timeline, because then you couldn't climb the first ledge. So what do you do? Bring a temporal displacement sphere with you, and hop up the first ledge in the Maxis timeline, then use the sphere to revitalize the broken machines in that next area and pass through. 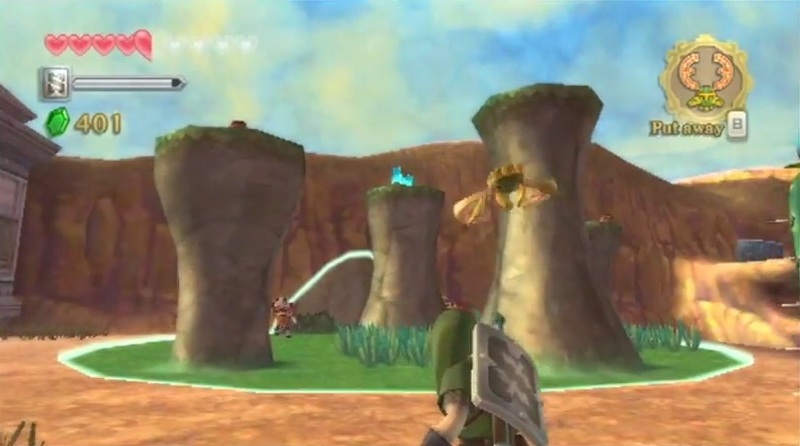 I don't blame you if your head is spinning, so just check out this screenshot from Zelda to see what I had in mind. the blue stone in the center reverts its affected area to its past state, where everything was still alive. Similar to that, except it shifts it to a different timeline rather than a different point on the same line. In addition to that would be a giant switch that changes the entire map. And the spheres always do the opposite of what the overall map is at a given time. This is one of the best ideas I have heard for the next Call Of Duty! By dynamically altering the map, you can solve puzzles, and even change the ending for the next instalment of zombies! Perhaps, there should be a constraint to inter dimensional shifting, as in multiplayer, some players could abuse this ability - just like your idea of the four dusty levers. The ending could be player determined, but to play at the heartstrings, the best possible ending should come at a price, with either one of the most loved characters sacrificing his life for the safety of Earth - such as Maxis destroying Agartha and Richtofen at the same time to ensure the safety of his daughter in a new world - or with everyone's memories erased of the two inter dimensional realms that have ceased to exist. (This could be cleared over with the Zombies community with a mid-credit sequence, in which one of the much loved playable characters comes across the remains of a zombie, before smiling and the screen cutting back to the credits with the original Zombies songs playing in the background to add to the nostalgia). This is a great idea EJ. This could absolutely work. Even from a developing/mapping point of view this could be achievable. Rock bridge in one dimension, tree top jungle rope bridge in the other. The only downside would be that twice the amount of mapping would need to be done. This is great idea I would to see a map like this. Oh I LOVED skyward sword! And the idea, the idea too! -Rift-charges: Creates temporary blips in the fabric of time and space, like a rift-change machine that you described, but localized. -Different weapons in each reality, meaning just because you've swapped domains, does not mean your weapons and tools have, it's important to maintain constant survival in BOTH realties! Yeah i imagined that there would be completely different wall weapons in each, and maybe that there would be 2 wonder weapons, each exclusively obtainable in the timeline of its respective inventor. Thanks for the feedback. I mean think about it butterfly effect style. If richtofen was in power, he would protect group 935, and they would go on to advance. So in the richtofen timeline there would be 2025 weapons. Swap over to the timeline where maxis destroyed it and it would be left as it was years ago, with only World War 2 / Cold War weapons.